When you look at yourself in the mirror, what do you think about your smile? Are you unhappy with it because your teeth are discolored? If so, you are not alone. Countless people think that their teeth are dull, dingy and not as bright and white as they would like them to be. Given the fact that the constant exposure to foods and drinks that stain the teeth, discolored teeth are extremely common. Even if you take excellent care of your teeth, keeping them bright and white can be a challenge. While discolored teeth are extremely common, that doesn’t mean that you have to live with them. If you are unhappy with the color of your teeth and you are longing for a brighter, whiter smile, you should consider having your teeth professionally whitened. Sure, you can use a tooth whitening product at home, but it won’t yield the same results that professional whitening will provide. A dentist has access to special equipment that can make your teeth gleaming white and make them look better than ever! Is your curiosity piqued? If so, then read on to find out more about professional tooth whitening. As the name suggests, tooth whitening is a procedure that aims to lighten the color of the teeth by removing stains and discoloration. It is the most common type of cosmetic dentistry, and it’s also the least invasive. It can dramatically improve the appearance of your teeth, and there’s no discomfort. While the results of whitening can be impressive, if you are considering having this procedure done, you should be aware that it is not a one-time fix. You will have to have your teeth whitened every so often. Since you will continue to eat and drink after you have your teeth whitened, stains and discoloration will continue to happen. However, because this procedure is so quick and painless, having repeated treatments isn’t a big deal. The teeth get their natural, white appearance from a combination of things. The enamel, which is the outer layer of the teeth, reflects light. That, combined with the white color of the dentin that lies under the enamel, gives teeth their white color. Age-related. Over time, dentin naturally develops a yellowish color and the enamel that covers the teeth thins out. As such, the discolored dentin becomes more visible. Moreover, the older you get, the more your teeth have become exposed to staining. How is professional tooth whitening done? The process of professional tooth whitening is actually quite simple. Your dentist will place a whitening solution on the top of your teeth. This solution contains hydrogen peroxide, which has the ability to remove stains. After the solution is applied, your dentist will shine a special light on your teeth, which will activate the components in the whitening solution. The process can take anywhere from 30 to 90 minutes. You can see immediate results, as your teeth will be noticeably whiter after your first treatment. However, if your teeth are excessively discolored, you may need up to three applications in order to achieve the results that you desire. Why choose professional tooth whitening over home tooth whitening? There are dozens of products on the market that are designed to whiten teeth, from toothpaste to whitening strips. Given the availability of these products, you might be wondering why you should invest in professional whitening. While these products may be effective to some degree, the truth is, they can only do so much. In other words, they won’t remove stains and get your teeth as white as well as the whitening procedure that a dentist can perform. Even if you used these products on a constant basis (which isn’t recommended), the results wouldn’t even compare with those of professional teeth whitening. 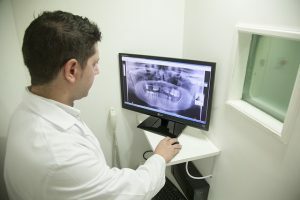 Add to that the fact that a dentist has the knowledge and skill to ensure that your teeth will be properly cared for during the procedure to prevent any potential side effects from occurring. If you are tired of hiding your discolored smile, teeth whitening is an option you should seriously consider. To learn more about tooth whitening or to schedule an appointment, give our office a call today! We’ll give you a gleaming white smile that you will be proud to show off!